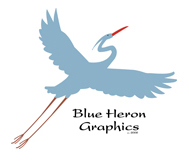 Laurie Prindle founded Blue Heron Graphics in 2001. Since then she has helped small to medium-sized businesses and non-profit organizations throughout the Bay Area with their brand development. With a background in adult literacy and project management, Laurie brings her special blend of creative talents as well as communication and organizational skills to her work as a graphic designer. We believe that communication is key in making a business a success. We will listen carefully to you so that we really understand your business and your goals. We will assist you in developing an attractive, unique brand for your business that will help you better communicate with your customers/clients about your products and services. Most of our business comes from referrals so we're always happy to do a free 30-minute consultation with no obligation. AlterNetRides Loprest Water Treatment Co. Call today to schedule a free 1/2 hour consultation!